Caryn Hartglass: Hello everybody, I’m Caryn Hartglass and you’re listening to It’s All About Food. Very good day to you and I’m so glad you’re here and listening. Thank you so much for joining me. We’re going to talk about some fun food things today and you know me, I love, I love talking about food and we’re going to be talking about some really good food today. The good news and the bad news but I think it’ll all end with some really good new, okay? So let’s get started. I want to bring on my first guest, Simon Lester. He’s an entrepreneurial CEO and strategist who focuses on consumer facing industries and investment opportunities. He founded PASCHA Organic Chocolate, born from a desire to create the simplest, purest and most delicious chocolate without any of the additives or ingredients that might trigger allergic reactions for those with food allergies or intolerances. Hello Simon. Simon Lester: Hi. How are you? Caryn Hartglass: Good, how are you? Simon Lester: Pretty good, thank you. Caryn Hartglass: And you’re ready to go? You’re back from the big food expo out west? Simon Lester: Back from the big food expo out west. We’ve been talking solidly for the last 3 or 4 days so excuse me if my voice is a little tired but that’s the game. Caryn Hartglass: Okay, no problem. So let’s just get up to date on why you founded PASCHA Chocolate because it’s an important story. Simon Lester: Well my background was in chocolate years ago. The very first job I had coming out of university in England. It never really struck me at the time. I’ll never forget my first – I worked for a company called Cadbury which is a big British chocolate company that became a part of Kraft. I’ll never forget my first week in that company. We were sort of supposed to learn the ropes of the chocolate business so the first thing we did was we were sent to the milk processing facility and you go from there to the chocolate plant and you walk in and you see bags of nuts and you smell the milk. You just assume that that’s normal and then years later, you come back to thinking about chocolate. I discovered that I had various food allergies, in particular to certain nuts and to milk. One of my daughters had a very severe food allergy, she’s anaphylactic to shellfish. And it was the realization that struck us that it’s not a big exposure you need to cause a problem, it’s a tiny exposure. Sometimes it’s not even consuming it; it’s simply being near it or breathing something that you’re allergic to that causes the problem. Once we realized that, with my daughter in particular, the penny dropped in relation to chocolate. I thought back to my original Cadbury experience when any of these chocolate plants you walk in, they are full of these allergens, these things that actually, to some people, make the chocolate taste nice but for other people they’re poisonous. The whole problem with chocolate, in particular with chocolate, is that you can’t get rid of them within you’re production process. Once it’s there, it’s there. Once the nuts have been down the line you get little bits of residue that stays. And we just thought, somebody needed to make ultra clean, ultra pure chocolate that was safe for anybody who can’t have the milk and the nuts. And that’s what we tried to do. Caryn Hartglass: Well I’m glad that you’re out there because the more I dig in and learn about chocolate, the scarier it gets and we’re going to touch on some of those scary things. But chocolate itself is a very simple thing coming from the cocoa plant. I’ve seen some of these fruits when I travelled to Costa Rica. The way I think we should be eating it is practically pure without all these other things added to it. What so many people don’t realize, when we don’t have allergies, if we read the label and if we read the statement that a food that has been processed on equipment that has been processed with other allergens, most of us don’t realize that if we do have a serious allergy, that means you can’t touch those foods. Simon Lester: Correct. It’s a fundamental point. In fact, I think it was the Canadian government that did a study. They measured, I forget how many bars but a whole load of candy bars that had that statement on the back “may contain traces of” or “made in a facility that also processes”. And I said, well I wonder what sort of percentages of that bar is made up of these undisclosed allergens. And it’s actually extraordinary. It’s not nothing, it’s sort of half a percent of the bar or a third of a percent of the weight of the bar. Simon Lester: Very, very significant. I actually was talking with another chocolate maker a couple months ago. They make a product named that they call 99% cocoa in the ingredients and there’s nothing else in the ingredients to declare. So I said, what’s the ingredient? Well, we don’t know, it’s whatever else we picked up in the line from residual production. That’s the point. They couldn’t call it 100% because it’s not and you don’t know what else is in that. Caryn Hartglass: Well I would like to see that Canadian study on the chocolates. You’re probably aware of a recent FDA study where they looked at, I believe, 100 chocolates and many of them claimed they were dairy free in a variety of different ways. Either they said they were completely free of dairy or they said they contained no trace of dairy and there were different levels but most of them, whether they said they had or didn’t have it, did have significant amount of dairy. For someone that is allergic, that’s terrible. Simon Lester: Oh, absolutely. Back in my early chocolate days, back in England, our standard dark chocolate contains milk as a declared ingredient. Of course, nobody ever reads the back, or they didn’t in those days. But dark chocolate simply meant it was a darker form of milk chocolate. So all of those products have milk and stuff but then there are all the others that don’t even have it as an ingredient but do pick it up as a residual component from prior production down that same production line. Caryn Hartglass: Now I’m a vegan and I look for foods that don’t contain animal products, and that includes milk. I’ve been purchasing dark chocolates for a long time that don’t list milk on the label and I made a concession recently that’s if a chocolate was processed on dairy equipment, I said that must be okay because that’s probably so insignificant. This will allow vegan chocolate companies, companies that are making non dairy chocolates that will allow them to build and grow because they have to originally lease some equipment. But I’m kind of horrified to discover that I have probably consumed a certain amount of dairy, unknowingly. Simon Lester: Well you have, unfortunately. And it’s really – it’s endemic within the chocolate production process. If you’ve ever messed around with chocolate in your kitchen you would realize that many food products – you can clean your production line with water. You can sort of flush them down after a production run but chocolate and water don’t mix. So it’s hard to clean the line with water and you certainly don’t want to go clean it with chemicals so it’s a bit of a problem. So what do you do? Really, you just rinse away all bits of chocolate and that’s as much as you can do to clean it. Caryn Hartglass: Okay, so tell me about PASCHA Chocolate. You must have – did you purchase all new equipment? Simon Lester: Well we’ve done two things. Firstly, we went – having had this idea to get this business going and to create this pure chocolate, my first thought was well, there has to be somebody out there making it or able to make it. So I went all through the UK, Ireland, Europe and Switzerland. I went all through Canada, where we’re based, and I went all through the USA and I couldn’t find a single facility that was clean enough to make it. That was quite an eye opener when company after company said well, we don’t use this but we use that. Or we use and we’ll try to clean the line for you but it just didn’t work. So in the end, we went down to Latin America which it’s very interesting because firstly, it’s where many of the finer tasting cocoa beans come from. But secondly, within their diet, it’s just not so normal to consume milk. It’s not a dairy based culture that they have. They don’t systematically drink milk or cook with it like we do in North America. And that was interesting because it allow us to find 2 or 3 different companies were able to put together a production plant that was clean enough for us. It was a clean facility where they never touched these things. The problem then was that the chocolate just didn’t taste very good. It would clean but they didn’t know how to make great tasting product. That’s when I just got some of my old Cadbury buddies who were sort of kicking around in Toronto and we just basically re-engineered the recipe. In the early days, we just took that recipe and took it down to Ecuador and Peru and we got that made up for us in a clean facility which I’ve been down and checked out. Actually, it’s extraordinary the detail these guys and the attention that these guys pay to the cleanliness to the production systems. As an example, every person who comes into that factory to work on the production floor, they walk in and they have to completely change all their clothing into this fresh, clean production clothing so there’s no risk that somebody has a peanut butter sandwich stuck in the back pocket of their jeans or whatever else it may be that we would be troubled by. So terribly, terribly clean down there. So that’s what we did in the beginning but as we developed beyond that, we actually just purchased a whole load of brand new production equipment which we’re putting into a facility in the US. In fact, it arrived literally last week and it opens up in a couple weeks time. So that’s a very exciting development for us. It will be the cleanest chocolate production facility in America. Caryn Hartglass: And probably in the world! Simon Lester: Probably in the world, actually. It’s scary stuff to think about, managing and controlling but it will be ultra clean. We’re just fastidious, it’s the only way. Caryn Hartglass: Well I’m very excited to find about you because I’ve been looking at so many different brands of chocolate. Other than allergens, and we may get back to that subject if we have some time, there are other issues that are coming out about chocolate. One of them is using child slaves to harvest cocoa. Caryn Hartglass: Fortunately, well according to the Food Empowerment Project which lists chocolate and investigates where chocolates are sourced, you get an A grading where you get sourced from places that have child slave labor. Simon Lester: Well that’s good to know. The real problem is that the chocolate world is much like the coffee world in that there are really kind of two standards of bean. Just like in coffee, you have got the Robusta or an Arabica or the beautiful aromatic coffee made with the Arabica beans and then the kind of the course general beans that are made for this Robusta coffee. And so in chocolate, you got this course dense beans that predominately come from West Africa, places like Ghana and the Ivory Coast. They produce a vast percentage of the world’s cocoa beans. I don’t know the number but it’s a very large percentage. Those are the areas that fall, for many reasons, are associated with this sort of child slave labor culture and it’s not to do with the big coffee companies. Maybe they hadn’t done as much as they could or should’ve done to oppose it but I think it is – it’s a much more complex problem than that, that’s somewhat systematic within the environment at which those beans are grown. So it’s unfortunately somewhat coincidental that most of the cocoa beans come from these regions where that child slave culture is allowed to exist. It doesn’t mean that a company like Hershey’s or Mars are causing that problem, they just inevitably have to use those beans. I’m sure they would much rather take beans that are processed in more favorable environments and that they are all making huge efforts to do that. Because we don’t source from those regions, we source from Latin America where it’s a different culture, it’s a different process and it’s much more family based. You see a lot of very small family plantations that are growing these cocoa beans. I laugh; you read some of these little chocolate companies that talk about the fact that they are buying directly from the farmers. I really don’t understand how they are doing that because most of these farmers are just tiny, 4 or 5 acres or so of cocoa trees that they are harvesting 2 or 3 times a year and that’s sort of how their eating out and eating. It’s the family together and the kids. It’s not slave labor at all, it’s just great that they have the opportunity to make that living and provide those beans into the market place. That’s how we work out there and we work through fair-trade. All our chocolate is fair-trade and we go down there and visit the plantation, some of the farmers and visit the local people. Who knows, you make a visit twice a year. Do you see everything? Probably not, but to the best of our knowledge, the practices there seem pretty good. Caryn Hartglass: Well that’s good to hear. Now the other thing that’s been coming out about chocolate, and I don’t know if you know, with regards to your own chocolate, how it fairs, but there has been concern about cadmium and lead in chocolate. Simon Lester: Well, there is concern and it’s a complex area. Cadmium and lead, more so cadmium and less so lead, are naturally occurring metals or they can be naturally occurring metals. They can also be non-naturally occurring metals. So you find the highest concentrations in areas where there is metal pollution from gas fumes or whatever else. But as naturally occurring metals, you find those ingredients or those metals everywhere. So potatoes or green leafy vegetables will contain these because they absorb them from the soil. The soil content plays a big part in determining the amount of that metal that might get into the plant. It’s not the only thing; there are far many practices. Do they use fertilizer? Do they not use fertilizer? What’s the micro-climate in terms of the way rainfall occurs and the way it leaches? Different metals and stuff through the soil. There are many, many factors. All we can do as chocolate makers, as we do, is measure the content of these metals, watch them, monitor them and make sure we design our products in a way that minimizes the likely occurrence. Even though we do that, the biggest factor is really about the amount of chocolate that people consume. As long as people are consuming what I might call a reasonable amount and there not sort of wolfing down bar after bar, they’re not going to put themselves in a position, with any chocolate that I’ve seen, where there is any danger of getting over the World Health limits, the European limits or the FDA limits. So it can become a motive but I don’t think it is for the vast majority of people eating a reasonable and sensible quantity, I don’t think that’s a real worry factor at this time. Caryn Hartglass: Are you aware of the As You Sow recent study on chocolates? They’ve discovered so many different brands of chocolate that have levels that they consider, at least according to California’s – I’m looking for exactly the wording I have for it. Are you familiar with that organization and their recent study? Simon Lester: I read a headline about it a month or two back but I have not seen the study, I must admit. Caryn Hartglass: They said that 26 of the chocolate products contained lead or cadmium at levels in which one serving exceeds the California safe harbor level for reproductive harm. All they want is these companies to label their product but you said companies do test from time to time to see where they stand with these things or is that not routine? Simon Lester: I can’t speak for other companies. Simon Lester: But it’s something that most chocolate people are aware of because we are using – much like potato farmers, is taking a potato out of the earth that would have absorbed whatever was in the earth, so a cocoa bean is growing in an environment where it will absorb nutrients and minerals from the soil. We have to watch these things carefully. It’s not an easy analysis that’s done every week but it’s more periodic. I was talking to one of the cocoa producers in Peru last year. They said they systematically test every batch. They got a measure that they are measuring against which I think is the World Health Organization level, I could be wrong about that but it’s a reasonable standard to take. If they got a batch of cocoa beans that are over that limit, they will abandon the batch. They won’t use those beans. That’s a great, responsible attitude. Is everybody doing that? No. Simon Lester: With the biggest producers in Peru and first, I was impressed that they were aware of it, that they were testing for it and analyzing every batch. That was great. Caryn Hartglass: Now let’s get back to your delicious PASCHA Chocolate. Now one of the things that you don’t have is soy lecithin. You don’t have any soy in your chocolate because it is an allergen. I was recently reading about Hershey’s and how they’re not importing Cadbury made in Britain anymore and the Hershey’s version of Cadbury is different than the British form of Cadbury. The Hershey’s form uses more sugar and different emulsifiers and we often see soy lecithin as an emulsifier. I understand it helps shelf life and whatever. How did you do that? Simon Lester: Well the shelf life is one thing. The real big thing you’re trying to do in chocolate is manage what we call the viscosity, which if you like, is the flow ability of the chocolate. You have got this chocolate mass that you have made and it’s warm, it’s molten and it’s flowing or flow-able. You need to pulse that and do things with it before it cools and hardens because once it’s cooled and hardened, you can’t get it in the bar or the shape of the bunny, the egg or whatever it is you’re trying to make. So we have to manage the viscosity or the flow ability and soy lecithin or any lecithin really is wonderful for doing that because just a tiny amount of that emulsifier enhances the ability of that product to flow. So as an industrial ingredient when you’re making chocolate on a very large scale, it becomes terribly important to use that because if you’re making tens or hundreds of tons in a batch and it doesn’t flow properly, you have got a huge problem and a huge mess. So it’s systematically used in large scale production. Now there’s a way of getting around it because you can simply increase the fat content, what we call the cocoa butter which is the fat part of the cocoa bean, you increase that content within the chocolate mixture. There’s roughly a 10 to 1 ratio between the emulsifier and cocoa butter so in other words, if you’re using 1% of an emulsifier, it’s like using 10% or having an additional 10% of cocoa butter in your product. Well guess what, the emulsifier, the soy lecithin, is way cheaper then 10% of cocoa butter. The increase of the fat content may not sound like the best thing to do for health but actually the cocoa butter fat content is primarily oleic acid, it’s a very healthy form of fat. This is noted in over 6 healthy fats within that. From a health perspective, that’s not a worry, it’s really from the cost perspective that the bigger companies don’t want to do that. Now when you’re at a smaller scale like we are, it’s much more important as you said to avoid the allergens but also when making a smaller batch and using a smaller amount. It’s less of an impact on us financially to do that and easier for us to take the higher stance now. If I was producing thousands of tons a week or in a day in a huge plant, I would understand a different argument but where we are as a company, it makes no sense to do anything different. Caryn Hartglass: Well bigger is not always better. Simon Lester: No it’s not. I think the whole world is beginning to realize that this whole huge industrialization wave over the last hundred years, it’s really causing problems. Caryn Hartglass: Well I’m really starting to dislike the word “efficient” more and more. Caryn Hartglass: The cost of efficiency is so overwhelmingly high, maybe not in terms of dollars but in terms of our health, the environment, the economy and people’s welfare. Simon Lester: Absolutely. Think of the exponentially growing healthcare costs. If we all were able to take greater responsibility and control the health and if we could all actually trust the health and rely on a healthier set of ingredients from these large, huge food industries, then the nation’s health bill wouldn’t be nearly as bad. There’s a huge cost and it’s just a question for who bares it. 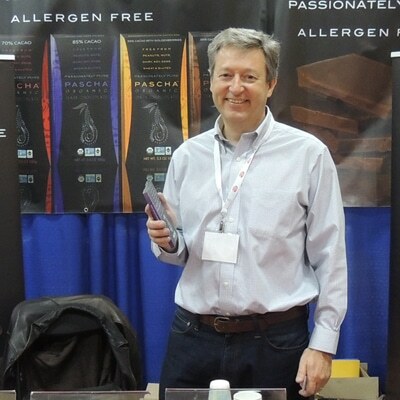 Caryn Hartglass: Well Simon, I am so glad that PASCHA allergen free, organic dark chocolate is here for us to enjoy. I’m glad you’re small although I would love everyone to be able to enjoy your chocolate so maybe more little PASCHA’s will pop up somewhere. Simon Lester: Exactly, maybe we could get a little bit bigger and it will be just enough. Caryn Hartglass: And I’m so glad you have a chocolate chip. I love making cookies and I have a niece who has celiac disease and every time I would look in the stores for a chocolate that I could be convinced didn’t have any wheat or any bit of it, it just didn’t exist. But you got it. Simon Lester: And we do. We’re very happy with our products we just need to sort of get them out there and make them available to people and show them that small is beautiful and small is better. Caryn Hartglass: Great, well thank you for joining me on It’s All About Food. I like to say that every food has a story and chocolate has a story and PASCHA Chocolate is a beautiful story. Thank you. Simon Lester: Thank you so much. Caryn Hartglass: Okay. That was Simon Lester and please visit www.paschachocolate.com, that’s P-A-S-C-H-A Chocolate. It’s well worth it, I’ve tried it. It’s delicious. It’s a little pricier but you’re not paying for child slavery, you’re not getting the allergens if you’re concerned about that and if you truly want a dairy free chocolate, this is it. This is the only one and if you know of any more at info@realmeals.org. All right, let’s take a quick break and we’ll be back with a plant-based doctor. Do they test for mycotoxins? You can contact the company and ask at http://paschachocolate.com.